"Excellent advice. Provided support throughout the process. Molly is a Top notch professional making the listing easy and resulting in a quick sale. Would highly recommend!" - richard k ingram, Canton, GA.
My house sold in two days. "Molly was fantastic to work with. She was always quick to respond to any questions that I had. She was very friendly, honest and eager to help in anyway she could. My house sold in two days." - Char haddock, Canton, GA.
... we had a contract in less than 24 hours. "Molly was wonderful to work with! She gave the right tips we needed to get our house ready to put on the market, and when it was listed we had a contract in less than 24 hours. She was the absolute best… efficient and professional. Selling our house couldn't have been easier thanks to Molly!" - James Craig, Jasper, GA. Anyone using her would be greatly satisfied. "After working with Molly, she would be the one that I would always go to, If she couldn't answer on the first call I made to her, she would be calling me back within the hour. She is great to work with. Anyone using her would be greatly satisfied." - kendra kessler, Holly Springs, GA.
As expected, it was effortless on our end and we have successfully sold our home. "Molly was our realtor when we sold our house and purchased another one 2 1/2 years ago. She was all over every aspect of both so we didn't hesitate to give her a call to sell our home again. As expected, it was effortless on our end and we have successfully sold our home. Thank you, Molly!" - jill c larson01, Woodstock, GA.
She answered every question and explained every form and every part of the process clearly and thoroughly. Selling a home in this market in 700k price range is challenging, but working with Molly made it as painless and straightforward as possible. We highly recommend her. - Burlea Olga, Cagle, Jasper, GA 30143. Her active presence and spotless reputation in this area made it an easy choice. "My wife and I called on Molly McGrory and her team to sell our first house. Our first meeting at the property went very well. We were on the same page with the fair listing value and she educated us on the selling process. Her team listed it, actively reached out to prospective buyers and the next day it was under contract! Molly and her team held a perfect personal/professional balance leaving my wife and I feeling confident and comfortable through the entire process. This could have been stressful and frustrating and costly had we gone with another Realtor. We went with Molly McGrory and her qualified team at Re/Max Town&Country and would do it again in a heartbeat." If you are not using Molly McGrory, you are doing it wrong! "If you are selling a home in North Georgia and you are not using Molly McGrory, you are doing it wrong! You will not find a more responsive, honest and knowledgeable agent in the area than Molly. There is a reason she is so successful. If you just want someone to list your home, pick anyone. But if you want someone to work with you as part of a team, with the goal of negotiating the best deal possible to get your home sold for the best price, there is only one choice. Thank you, Molly!" Listing to closing in less than a month! "Listing to closing in less than a month! Molly did a great job walking us through the process, but most importantly helping us strike the right balance of what to fix ahead of time, what to wait for inspection for, and what to ignore when prepping our house to sell so that it would show well. She knows the environment, the area, what buyers are looking for, etc. We were selling our old house in a state we don't live in any longer and Molly was even very helpful with anything we needed to do remotely! She provided advice and guidance on every step in the process. This was the 3rd real estate effort we had with Molly and they've all been excellent. I would HIGHLY recommend her." Molly answered all of our questions no matter how big or small. "Molly aggressively list and promotes homes for sale. We got a lot of people looking on line at our property and a lot of people visiting our home as a possible new home for them. We are very happy with the sale of our home through Molly's efforts." "Molly did an outstanding job getting our house on the market as soon as we contacted her. After our initial consultation and signing the sales agreement, our home was well displayed on several internet real estate sites. During the sales process she gave us solid advise, and carefully reviewed the offers we received. We would recommend Molly to anyone seeking real estate services." - Michele and Mike McGough, Canton, GA.
Molly is a terrific agent! "Molly is a terrific agent! Wonderful knowledge of the area and always quick to respond to my many questions. A true asset to the Cherokee county real estate market." Molly is a true professional. "Molly is a true professional. She was recommended to us when we bought our home 10 years ago and as first time home buyers we walked through the experience with ease and confidence because of her guidance. So, when we were ready to sell that home, we called Molly. She gave us great advice on minimal upgrades we needed to make in order to sell quickly and at a great price. From the time Molly listed the house until we closed was 44 days. Based on our experiences with Molly we would highly recommend her to anyone buying or selling a home." - Scott and Tam Gandert, Alpharetta, GA.
"Molly is a true professional. You can count on her accuracy, experience, and attention to detail. Over the years she has sold 3 homes for us. This last one required a complete level of trust as we left her an empty house in December, and we were 2700 miles away. Molly’s advice is spot on in listing your home, advertising, and in negotiations. Closings are smooth and uneventful because all the paperwork is accurately done. Communications are prompt, concise, and understandable. She earns her 5 star rating." - janet edmunds, Port Angeles, WA. Molly is always willing to work with you to sell your home! "Molly is very knowledgeable of our area/subdivision and is a multi-media marketer. She keeps you up to date each step of the way. Molly is always willing to work with you to sell your home!" Molly is excellent to work with. "Molly is excellent to work with. Within a week of the listing we had several showings and an offer. Molly made the entire process very easy she is a pleasure to work with. I highly recommend her services"
- aim inc, Woodstock, GA.
"Molly is OUTSTANDING! She has handled the purchase and sell of over 15 transactions for my family. As a repeat customer, I can clearly say she is the Best in the Business. A true real estate professional who will not disappoint you! Molly is the best in the metro area, by far. "Molly is the best in the metro area, by far. She's extremely knowledgeable of the market and has your best interest as priority. Awesome experience and I will be using Molly again." - Micah Ashley, Canton, GA.
"I had a little bit of an unusual situation and Molly did a great job working through it with me. When I wanted to ask more than she thought we should, she allowed us to try and then graciously brought things down to earth. So she did a great job of negotiating with me...and then for me. Molly knows her game and is willing to work patiently through what is a big life-changing event for a seller. Thanks Molly!" - David Jennings, Canton, GA.
Molly listed our house on a Saturday, and by the following Saturday we had a contract! "Molly listed our house on a Saturday, and by the following Saturday we had a contract! She helped determine a realistic selling price and helped us understand all financing. Molly answered all my questions and was always available. I'll definitely recommend her to others (I already have) and will call her the next time I need to buy or sell!" - green piano, Canton, GA.
Molly McGrory utilizes every tool to market your home. "Molly McGrory utilizes every tool to market your home. She goes above and beyond to showcase your home in the best light by using professional photographers and getting you the highest exposure and featuring your home. Our home sold in a few days. She is very knowledgeable in this industry! I highly recommend her services. "Molly met with my wife and myself and sold our house within 10 days. She was a pleasure to work with. All phone calls were answered or responded to quickly and we were kept in the loop throughout the process. It was an enjoyable and successful partnership. Would we work with Molly again? YES!!" 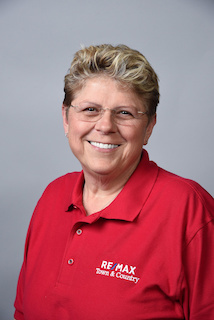 - Peter Steyn, Canton, GA.
Molly's years of experience and professionalism was very instrumental in us selling our home. "Having lived in Cherokee Co / Bridgemill for the past 8 years there was only one agent that came into consideration for listing our home, Molly McGrory. Molly's years of experience and professionalism was very instrumental in us selling our home. Our house sold in less than 90 days and we got our asking price! We highly recommend Molly McGrory and the Remax Town and Country Team Sixes Road!" - david alexander06, Canton, GA.
"Molly was the listing agent on the house I bought 15 years ago and her professional and personal interaction was so outstanding that I decided if I ever sold my home I would call her. My parents’ passed and I am the Admin for the estate and I wouldn’t call anyone else. My family appreciates how caring, authentic and personal Molly is. As we said to her - she understands that it’s not a house it is a place where memories are made and stored. Molly is outstanding and I would and do recommend her for any real estate needs you have"
- user2670283, Bays, Foster City, CA. "Outstanding service. Prompt follow up. My neighbors has has been on the market for 3 months. Molly sold my house in 7 days. Honest and hardworking. On call 7 days a week 24 hours a day"
She is a detail oriented perfectionist that provides the BEST service in the industry! "We have worked with Molly for over 15 years. She has always been informative on all aspects of selling, buying, and what is best for our family at the current time as it relates to real estate. She is a detail oriented perfectionist that provides the BEST service in the industry. Molly communicates consistently with her clients so they always know what's going on and are kept up to date with the sale of their home. From marketing to closing day you will have the most wonderful experience possible. I wouldn't want to put my family's future in anyone else's hands. Molly McGrory is a professional you can trust and will definitely call on again and again." She is a go getter. She is a hard working realtor. "I listed my house with Molly Jan 8, 2018. I had a good contract on Jan 10, 2018. She is a go getter. She is a hard working realtor. She was very helpful throughout the selling process." "Molly has been involved in 7 transactions for our family in the last 14 years. She is simply amazing. She knows all aspects of this business. She can handle all of the unexpected circumstances with ease. She is a master. I highly recommend her to list and sell a home. She is very knowledgeable, friendly and a pleasure to work with. "Molly has been extremely helpful in selling our house. She is very knowledgeable, friendly and a pleasure to work with. Molly did an outstanding job of marketing our home. She provided us with a professional photographer and advertised immediately though Beach Haven mail outs, social media and networking. Because of her diligence our house was quickly under contract. Molly has been there throughout the sales process to guide us and answer all of our questions. We highly recommend Molly McGrory owner/broker of Beach Haven Realty. Thank you Molly!" - mpbvarley, Inlet Beach, FL. she took all of the worries away. "Working with Molly is a pleasure! She is very knowledgable and makes the selling process easy and streamlined. This was my first time selling a home, and she took all of the worries away." She was honest, nice, and always available to answer our questions. "Molly is AWESOME! Cannot say enough good things about her! She was honest, nice, and always available to answer our questions. She always made us feel like we were important! My fiance and I would highly recommend her when you are buying or selling a home." Very smooth sale and closing. "Molly sold our home in 11 weeks after 4 other realtors had tried. And she listed it for more than the last realtor did. Very smooth sale and closing." - ca beckett, Big Canoe, GA.
We are thrilled with the work done by Molly! "We are thrilled with the work done by Molly! She helped us throughout the process and found a buyer within 2 weeks. We have no reservations with recommending Molly McGrory to list your property. Thanks Molly!" "Molly possesses a keen knowledge of the Resort real estate market from understanding the buyers/sellers needs to closing the deal. We felt extremely confident in her capacity to sell our home and meet all of our expectations in the process." - user4111224, Inlet Beach, FL. We will definitely use her for our future real estate transactions. "Not only did Molly sell our home quickly, but the home sold for the highest re-sell price in the neighborhood to date! We will definitely use her for our future real estate transactions." - BLAKEL OMONACO, Ball Ground, GA.
We would highly recommend this professional to anyone buying or selling real estate. "We've known Molly for nearly 20 years but had our first personal experience with her professionally recently when she helped us sell a property. She listened carefully and was able to meet our goals within 45 days from when we first spoke. She is responsive and incredibly detail oriented. She knows the business, the area, and the market. We would highly recommend this professional to anyone buying or selling real estate." - cher nelson7, Ellijay, GA.
"Molly was very helpful in helping us sell our house. We would recommend her to anyone, her years of knowledge being in the business was very useful. She's very down to earth. Great experience! - joejoe0615, Cagle, Jasper, GA 30143. We would recommend Molly to anyone that's thinking about selling their house! "Molly was great to work with, and she was professional and gave us the assistance we required. We would recommend Molly to anyone that's thinking about selling their house!" When we hired Molly, she got a contract on our house in less than 2 weeks. "When we hired Molly, she got a contract on our house in less than 2 weeks. It had sat on the market for months with no offers. After she took over we had multiple offers. We highly recommend Molly McGrory!!" - zuser20150220064642956, Ball Ground, GA.